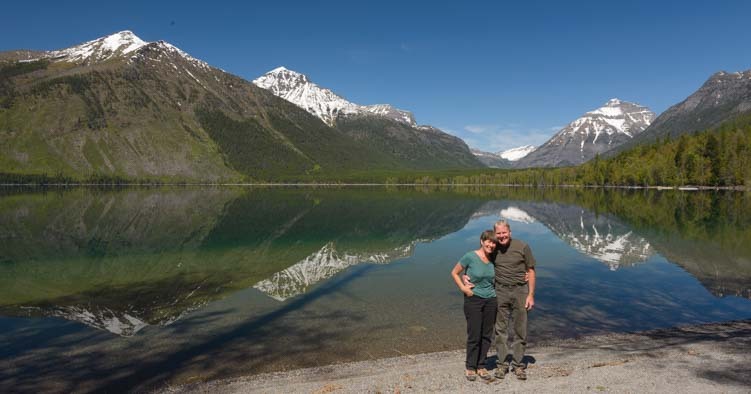 May 2016 – After enjoying a bit of the cowboy life and ranching life of the Bitterroot Valley in Montana, and then taking a zippy day trip over to charming Philipsburg, we took our RV north to Glacier National Park. This park is tucked right up against the Canadian border in northern Montana. 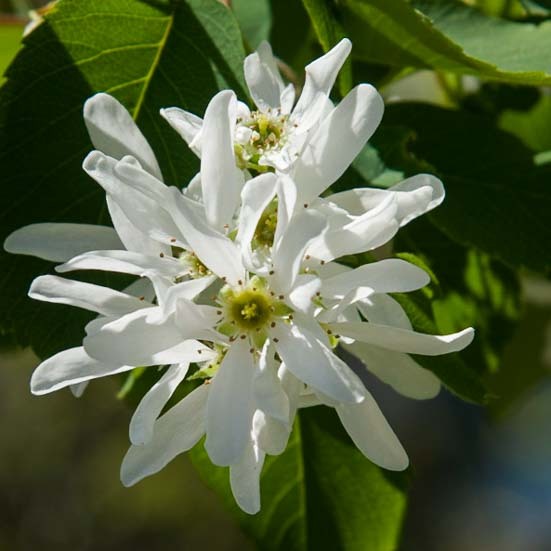 It was early May, and the main road through the park, the Going to the Sun Road, wasn’t completely open yet due to avalanche activity in the appropriately named Avalanche Creek area. But the road was open as far as Avalanche, so we took full advantage of doing a few drives up and down its length. 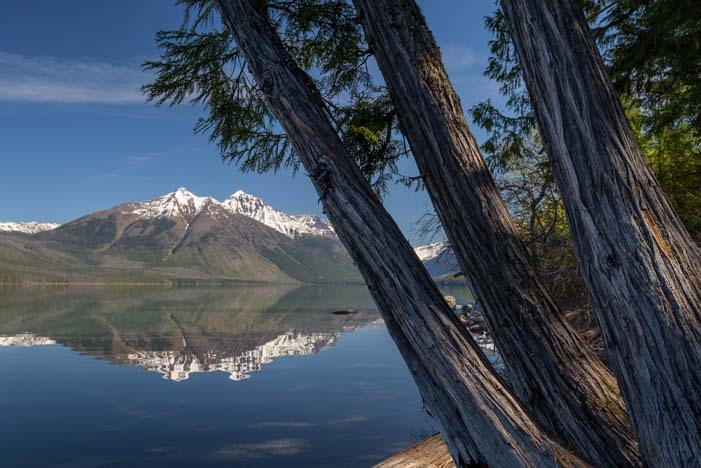 We had been to Glacier National Park once before, back in the late summer of 2007, and we had dashed through the park so fast that we didn’t even notice the large and beautiful Lake McDonald that greets visitors coming in from the southwestern entrance. Oh my!! The early morning air was very brisk when we drove alongside this stunning lake one morning, and the trees stood utterly motionless and silent. Hardly a breath of wind stirred their leaves. 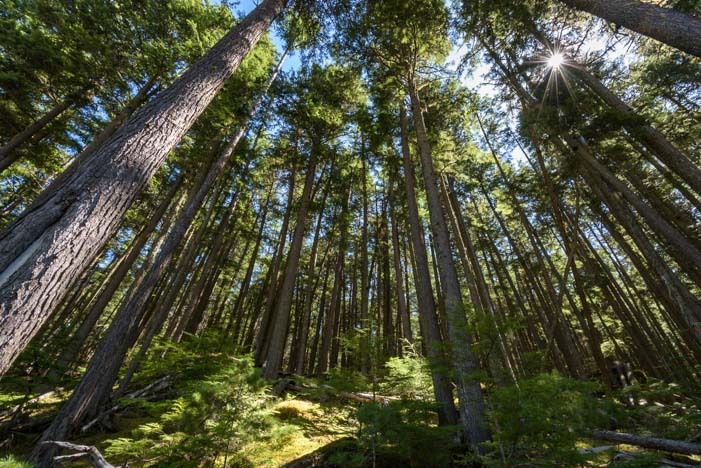 The thick woods were lined with a lush carpet of moss, and the sun filtered between the trees. The water was like a mirror, reflecting everything in its depths. And it was so clear that we could see each and every stone on the bottom perfectly. We stopped at McDonald Falls where the water coming down from the mountains rushed past us in a blur. McDonald Falls was moving fast! A few wildflowers were just starting to peek their heads out here and there. Flowers were just beginning to bloom. It was one of those ideal mornings that you wish could last forever. When we got to Avalanche, we noticed that cyclists were unloading their bikes from their cars to ride a few miles further up the road. Because the road was closed to cars up ahead, they could do this wonderful bike ride without having to share the road with anyone but other bicyclists. What fun! We hadn’t brought our bikes this time, but made a mental note for the future. This pre-season bike ride opportunity is similar to cycling the McKenzie Pass outside Bend, Oregon before it opens to motor vehicle traffic, something we had really enjoyed doing two years prior. Only the first third of the Going to the Sun Road was open to motor vehicles. 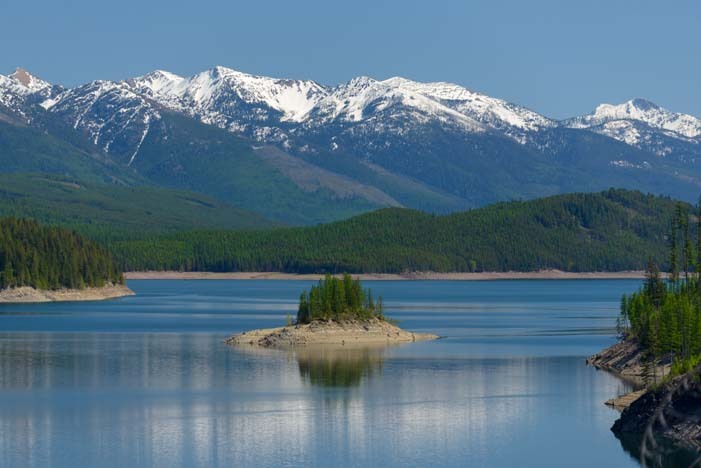 Nearby, the Hungry Horse Reservoir made for another lovely day trip. Again, we were blessed with crisp air and sunny skies. 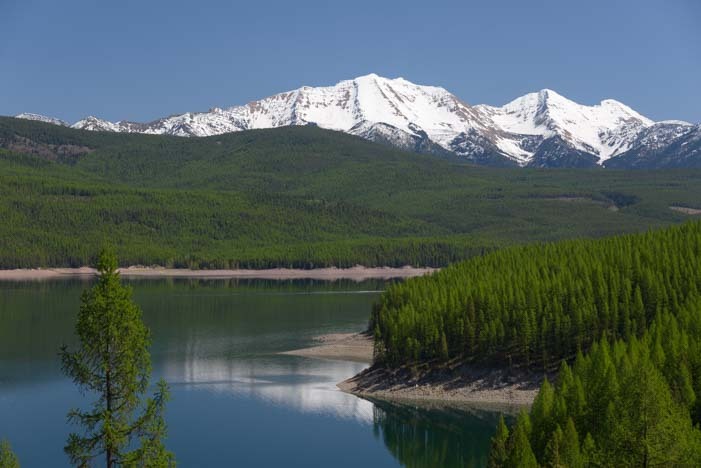 Snowcapped mountains framed Hungry Horse Reservoir. 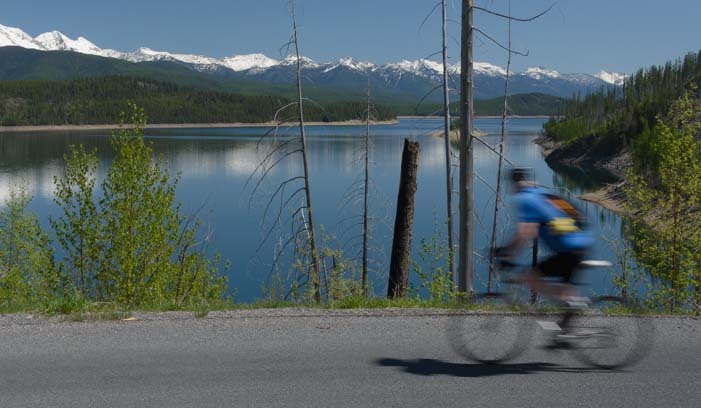 The road winds along the south fork of the Flathead River and along the reservoir, offering pretty views of the river and reservoir the whole way. We got out at one point and hiked down to a pebble beach where a series of tree stumps made for an eerie scene. 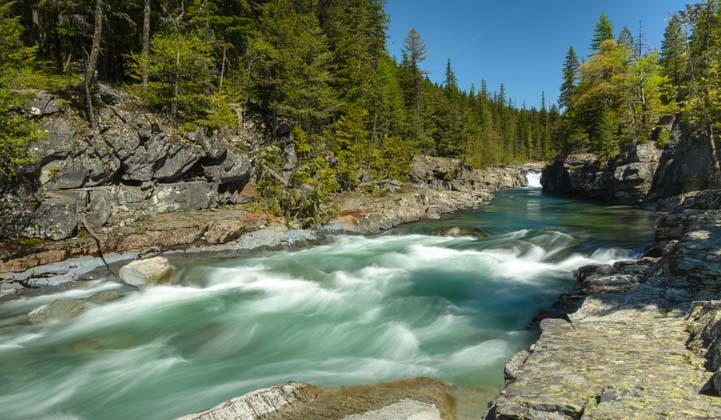 A man sitting in a camp chair at the trail head and working on his laptop while soaking in the view of the river told us that he remembered the river before it was dammed, back when those tree stumps were towering trees at the water’s edge. 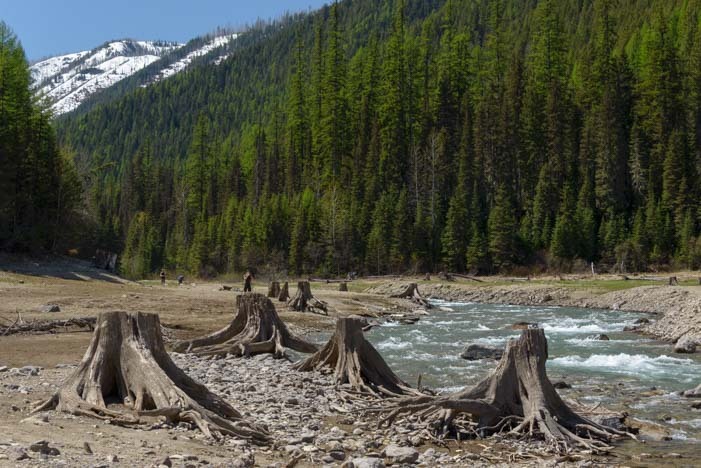 Before the river was dammed, there were tall trees on the shore. Crossing the Hungry Horse Dam, we got a terrific view of the mountains backing the reservoir. This would be a great road for a bike ride too, and as we stood staring at the lake a cyclist suddenly zoomed by, his eyes fixed on the pretty view too! 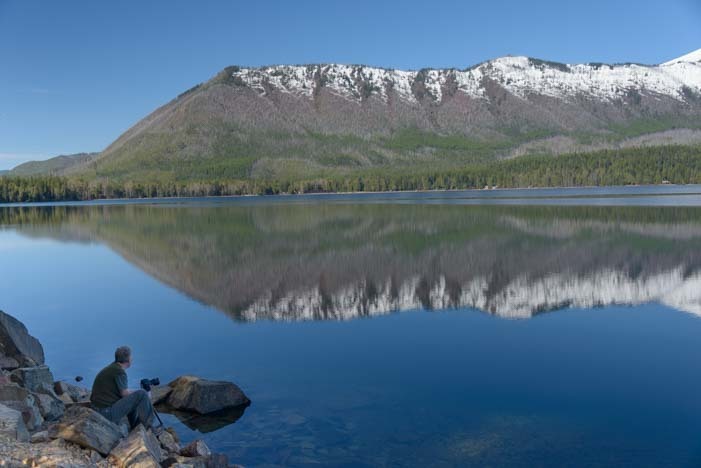 But it was Lake McDonald over in Glacier National Park that kept drawing us back. We drove the Going to the Sun road as far as we could a second time, late one afternoon, hoping for a knock-your-socks-off sunset to top it all off. 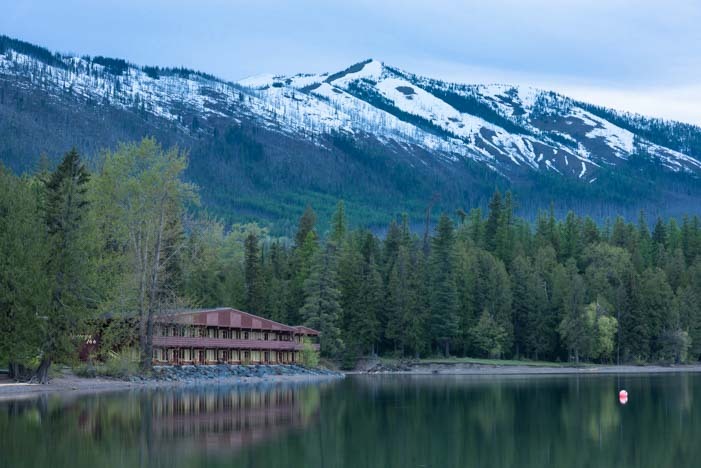 The pebble beach at the Lake McDonald Lodge was very beautiful, and we got a kick out of exploring the cabins at the Lodge, many of which were in the process of spring cleaning for the summer season. 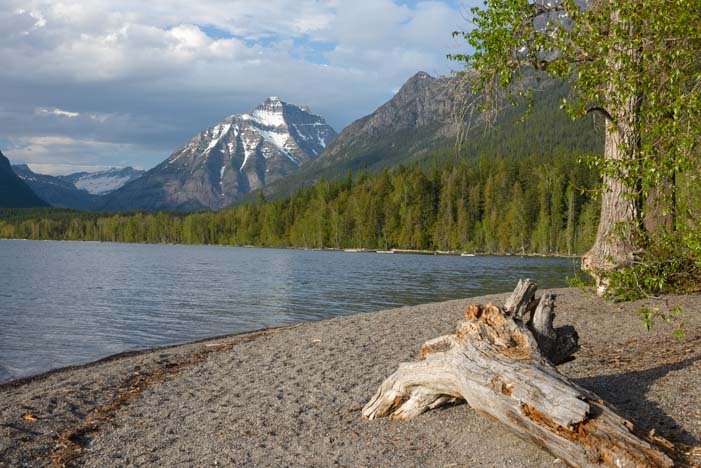 Late afternoon light lit up the shores of Lake McDonald. 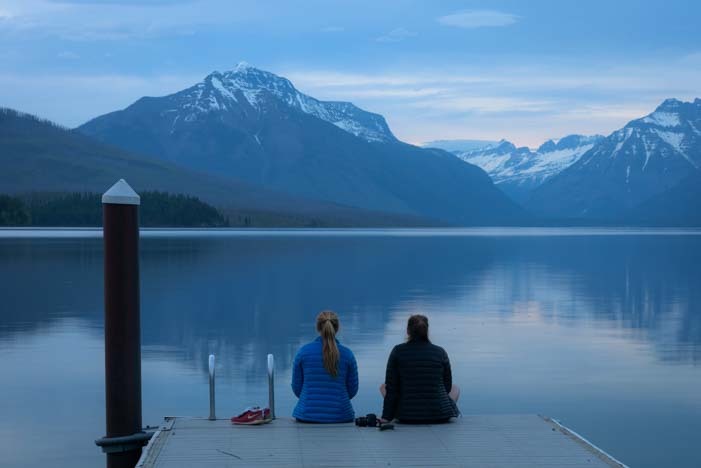 But we thought we might get a better view of the lake at sunset back at Apgar Village where there is a boat ramp that marches right out into the lake and offers a splendid panorama of the mountains. At Apgar Village there is a dock that goes right out into the lake. We poked around on the shore waiting for this oh-so-sensational sunset to happen. 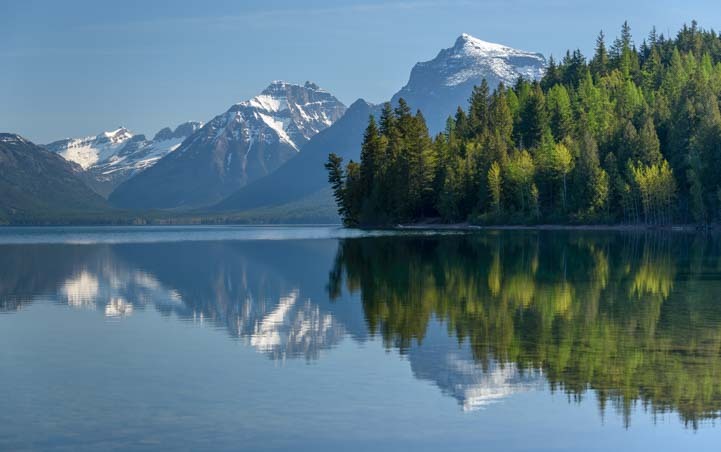 The lake undulated reflections of the mountains in shades of silver and blue. 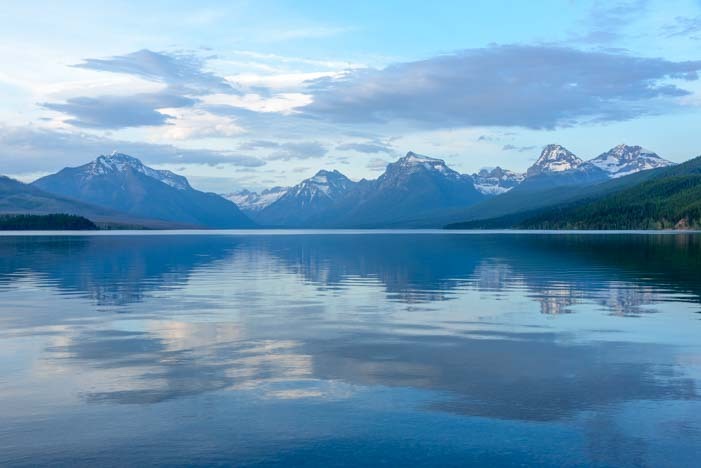 Silver and blue hues shimmer on Lake McDonald at dusk. 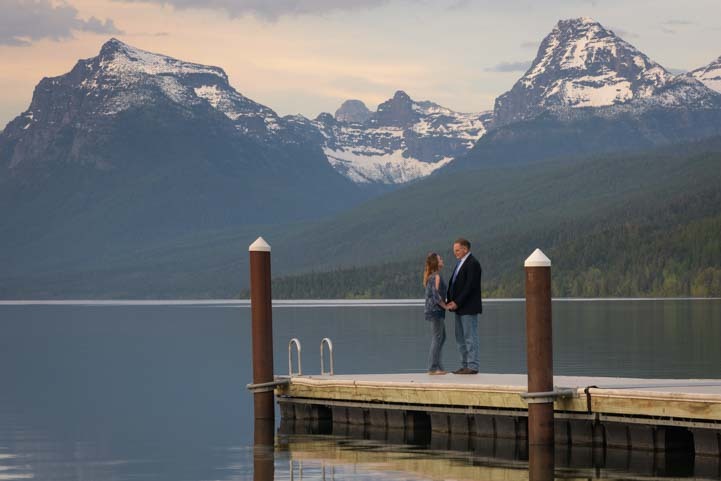 A couple came down to the dock with a photographer and did a bunch of romantic shots with the mountain backdrop behind them. They had had the same idea of catching this majestic view at the golden hour, sealing their undying love with a beautiful photo at Nature’s golden hour. But the skies just didn’t deliver that night, and the best we all got was a hint of pink. No matter. This place is gorgeous anyway!! We were on a mission to continue our RV travels north, so we didn’t stick around for the Going to the Sun Road to open up all the way to the top a few weeks later. But we loved what we saw and will hopefully be back for some wildflowers later in the season. This year we traveled north from Arizona ahead of the crowds by just a bit, and it made a big difference in many ways. Not only were there few crowds (and fewer people in general), but there was still snow on the mountains. However, the flip side was that the nights were often cold and many days barely got warm. Also, we arrived before the rangers had opened certain gates and attractions for the season. 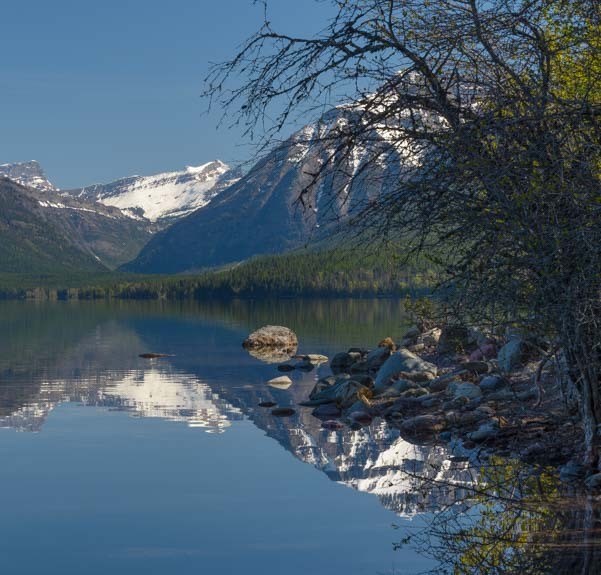 But I have to say, there’s a special intimacy to a place like Glacier National Park when you have the scenery to yourself, even if you’re shivering! 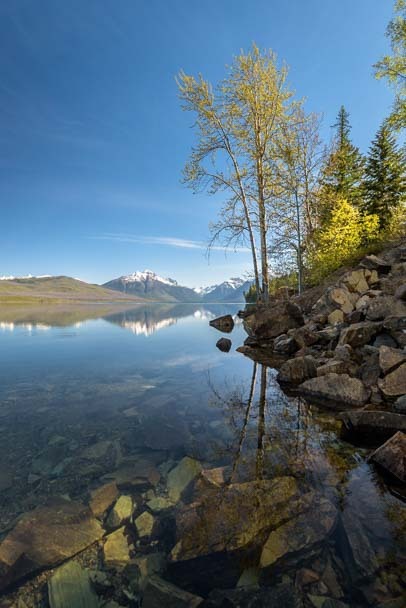 This entry was posted in Montana and tagged Montana, National Parks US, New, Travel, USA, Waterton-Glacier National Park, WP Travel by Roads Less Traveled. Bookmark the permalink. Just roaming through your posts, as well as others. Your solar setup cant run ac, correct? What do you do? Btw, my thoughts about your site/offerings—checking everyday for your next post. 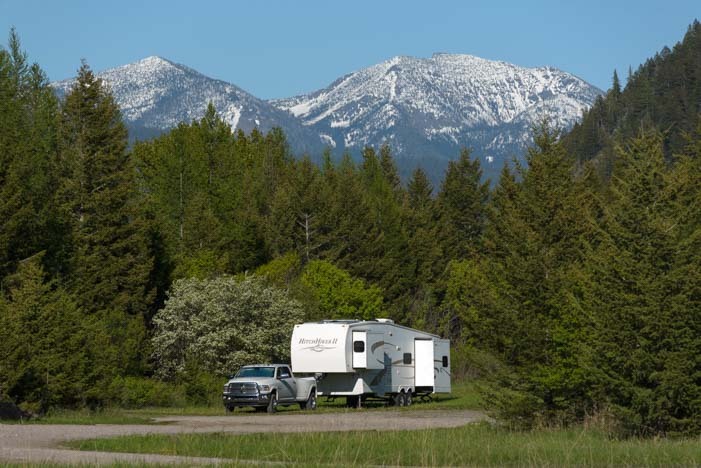 Just starting out on ft rving. Need all the help i can get, and really enjoy reading your info. I am living vicariously through you guys…for now. Keep them coming. We know what that’s like and it’s what motivates us to share our experiences now. Keep reading and dreaming, your time will come too!!! So beautiful — we planned to visit Glacier several years ago after 10 days in Yellowstone in late September — but it started snowing! So it’s still on our list. We also enjoy visiting parks just before or after the main tourist season. The weather can be a bit iffy (as you know) but it’s worth it for the (relative) solitude! 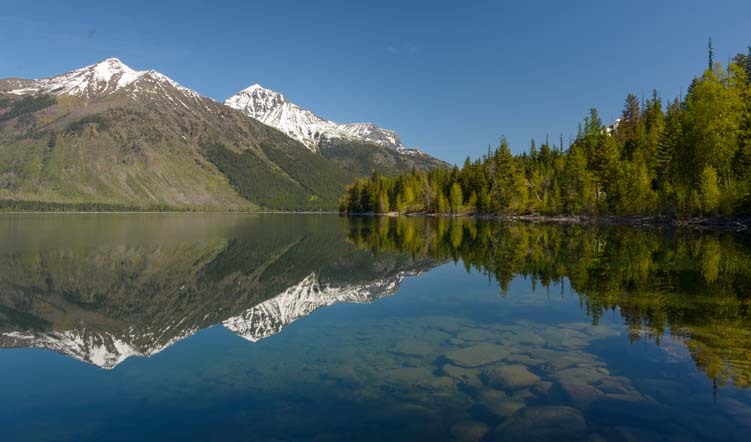 Love those mirror images of the lake! So true. We’ve been shivering for a few months now, but we’ve been loving every place we’ve visited, and the crowds, for the most part, have been manageable. Enjoy Glacier when you get there!!! Mark and Emily…..I can’t say enough about your photography…..absolutely stunning!! !….would you recommend any books for beginners? Thank you, Curt. We list all of the books, magazines, websites and online tutorials we have used to learn photography on our Photography page! Mark and Emily……there is so much I would like to say…..but I’ll try not to be long winded…I just want to try and convey how much your photos and your words have inspired myself and my girlfriend. We are a couple of years….perhaps less …from heading out on the road…I guess you could say we are in the saving…researching…and downsizing phase! We don’t want to have any debt when we start out and want to “get it right” the fist time as far as our rig and truck. What a heartwarming message, Curtis & Kelly. Thank you very much for expressing your appreciation!! It’s readers like you that motivate me to write, and it means so much to know that our postings here have had an impact on your life. Don’t worry about “getting it right” with anything the first time. There’s no such thing as “getting it wrong.” There’s only what’s right at the time of your launch — and you may find that whatever that is, it is not at all right for you a few years down the road. No problem! You will grow and change so much in your your new lifestyle that it will be only natural to change a lot of things around as you make this lifestyle your own, and the truck and trailer (or MH and toad) are part of that. Very little of what we have now is what we started with, including many aspects of ourselves. So, focus on what it is that you want, and don’t focus on avoiding mistakes. Whatever truck and trailer you can afford now and that says “home” and “adventure” to you is the right one. If you like the lifestyle and stay with it, you will probably have a different truck and trailer within five years, or you might switch over to a MH and toad. Who knows! Very few full-timers stick to one rig more than 6-8 years. And you’ll have as much fun shopping for the next pair of vehicles as you will for your first!! Enjoy the whole process, and if you don’t have a practice rig already, get yourself a little runaround rig or a good quality tent, air mattress, cooler and sleeping bags so you can get out there and have some fun (and start learning) right away! What stunning photographs! 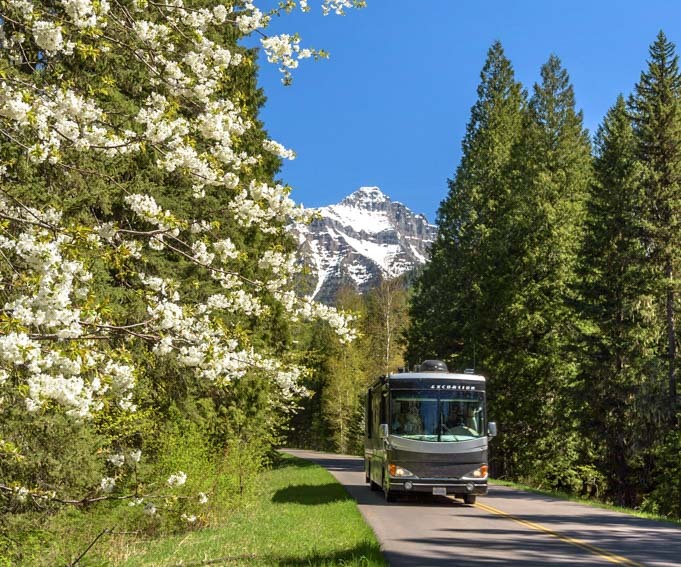 Thank you for sharing your experiences in Glacier NP, as we are hoping/planning to make it there this summer in our motorhome. However, I do have a question. I read on the NPS site that the maximum size for vehicles allowed on the Going to the Sun road was 10′ high and 25′ in length. Not so? Thanks! It is a very photogenic place, that’s for sure! You are correct about the size limitations on the Going to the Sun Road because there are tight switchbacks beyond the point where it was closed. We drove it with the truck and not the trailer. Have fun there!